Sanhedrin 78a ~ Where Do Snakes Store Their Venom? In the case of one who incited a dog or a snake against a person, and the dog or the snake bit that person, Rabbi Yehuda rules that the he is liable to the death penalty, and the Sages rule that he is not liable. According to Rabbi Yehuda, the poison of a snake is between its fangs, therefore the perpetrator is liable to execution by the sword [which is the usual punishment for a convicted murderer], and the snake itself is exempt from the death penalty. But according to the Sages a snake ejects its venom of its own volition [and only after its fangs have pierced the victim's skin]. Therefore the snake is liable to the death penalty by stoning and the perpetrator is not liable to the death penalty. A western diamondback rattlesnake. From here. A snake ejects its venom of its own volition. When the person caused the snake to bite its victim, it did not at that moment have the ability to kill. The person was merely allowing [the bite to occur], even though he knows [that very soon after the bite] the snake will expel its venom. In this case death does not occur as a result of the direct actions of the person. From the Koren Talmud Sanhedrin vol II, p 197. On R. Judah's view, the fangs themselves are poisonous. Consequently, the snake does nothing, the murder being committed by the person. But the Sages maintain that even when its fangs are embedded in the flesh, they are not poisonous, unless it voluntarily emits poison. Consequently the murder is committed by the snake, not the man. 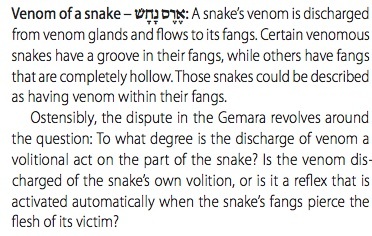 Leaving aside the question of what a snake does instinctually and what it does voluntarily, does a venomous snake have fangs that are always poisonous per Rabbi Yehuda, or not, as is the opinion of the Sages ? This really happens. A 2012 paper published in Medicine, Science and the Law describes how a contract killer used a poisonous snake to murder an elderly couple by way of a direct snake bite. So these kind of things do happen. The rulings of Rabbi Yehudah and the Sages are based on some anatomic assumptions Can biology help to determine which is correct? Why yes. It can. Snakes deliver their venom in one of two ways. The first and most common way is via a grooved fang usually at the back of the mouth. Venom slides down the groove and into flesh of the victim. A minority of venomous snakes use a different approach. These have long hollow fangs in the front of their mouths like hypodermic needles, through which venom flows. These fangs are hinged and are folded back into the roof of the mouth when not in use. Regardless of which kinds of fangs a snake has, its venom is produced in special glands. 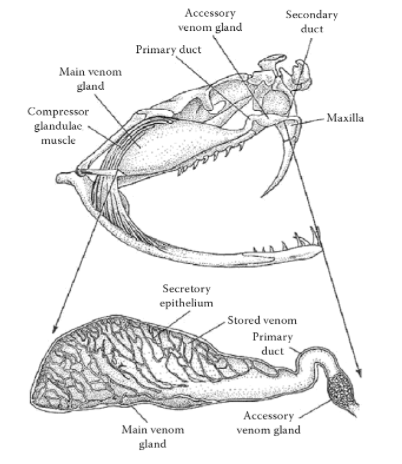 The precise anatomical details may vary from species to species, but they all have the same basic structure: there is a main venom gland which leads into a smaller accessory venom gland and then into the base of the fangs. — The Handbook of Venoms and Toxins of Reptiles, ed. Stephen P. Mackessy. CRC Press 2010. Viperid venom gland. When the snake strikes, muscles around the main venom gland contact, forcing a bolus of venom through the ducts, down the fangs, and into the prey. From The Handbook of Venoms and Toxins of Reptiles, ed. Stephen P. Mackessy. CRC Press 2010. p71. Not all bites from a venomous snake leads to poisoning. These non-venomous bites are called dry bites, and may occur in 20-60% of all bites. I know this because of this helpful paper published just this year by B. Sadananda Naik, a physician from Karnataka in south west India: “Dry bite” in venomous snakes: A review. In India, about 46,000 people are killed each year from snakebites, so he should know of which he speaks. The incidence of a dry bite varies by the species of snake and the circumstances under which they bite. For example, bites from pit vipers (found in the US) may be dry 25% of the time, whereas bites from the Sri Lankan saw scaled viper are dry less than 10% of the time (and you never know when that bit of information might be useful). The delivery of venom by the striking snake is completely voluntary; all the venomous snakes have the ability to bite without injecting the venom through their fangs. Hence, the snakes could vary the amount of venom injected while striking a prey which is to be eaten or when it bites in defence or when irritated. If a person set a snake against another, if the snake bit and killed, it is executed by stoning, because the venom which caused the death is expelled voluntarily. As a consequence the person who set the snake against another is not executed by the court. The majority opinion of the Sages is the biologically correct one, and Rabbi Yehuda was, anatomically speaking, mistaken. Snakes do indeed vary the amount of venom they release, and sometimes they don't release any at all. Which is good news if you are a snake charmer who has just been accused of murder.